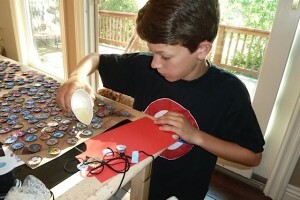 Nathan McCutchen raised $1000 for Trinity Center by making necklaces from bottle caps as part of a project for his bar mitzvah. The necklaces depicted swim team clubs and were sold at swim meets. My name is Nathan, and I am a seventh-grader at Walnut Creek Intermediate. 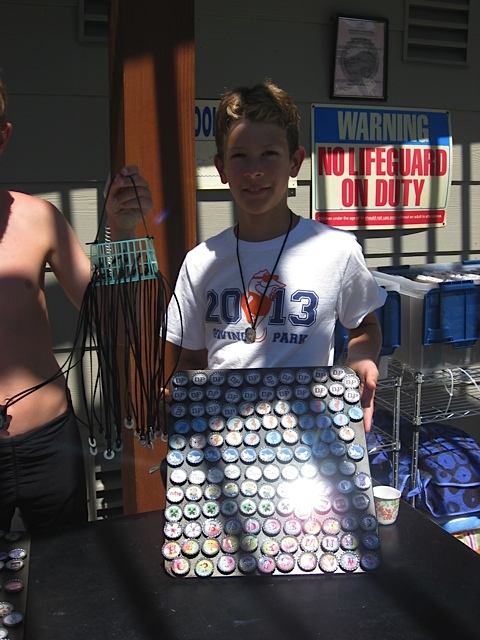 During the summer of 2013, I raised $1,000 for the homeless people of Walnut Creek, by selling homemade bottle cap necklaces. This money was used to provide three months of food for the homeless who use the Trinity Center; breakfast, lunch, and even dinner! I am turning thirteen and will become a Bar Mitzvah this year. As part of my Bar Mitzvah, I am encouraged to volunteer and help with a charity. I decided that I wanted to help homeless people in my town. I decided to raise money by making and selling bottle cap necklaces. I first found out about the Trinity Center through Victoria Johnson; a family friend. She is involved with Creek Kids Care, which supports the Trinity Center. When I told her about my project, she said that we should donate the money to the Trinity Center. I told her that it sounded like a great idea, so that’s just what I did. I decided to dedicate the money I earned to the Trinity Center. I found that making and selling necklaces is much easier said than done. At home, my family and I worked relentlessly on the necklaces. First, we would punch circular images from pictures we would find on the Internet. The pictures were normally of swim team logos or flowers. There were initials too. 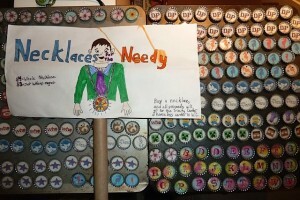 Then, we would “Modge-Podge” the punched-out pictures onto the store-bought bottle caps. After that, we would let them dry, and put another coat of “Modge-Podge” over the pictures. After they had dried again, we finally filled the bottle cap the rest of the way up with resin. After three days, the resin had set, and we would hot glue our very strong magnets to the back of each bottle cap. The whole process would take about four days to make a batch. Selling the necklaces was much easier than I thought it would be. I first started selling swim team logos to my own swim team. They turned out to be a big hit. I started selling other logos to other swim teams I met at swim meets, and they sold in the blink of an eye. Kids and parents loved them! They loved that the money was going to a great cause. The grand finale was the big swim conference meet, where all of the swim teams met to swim their final race of the year. I raised $400 there in just two days! Not only did I have fun making and selling the necklaces, but also, I felt good knowing that the money would be put to a great cause. I estimate that I spent about 30 hours on the project. I am also very grateful to friends and family who helped me make and sell the necklaces: The Johnson Family, Alex Halaszynski, Grant Holland, my sister, my mom, and my dad. I could not have finished without these people helping out.